Adding glamour and solving design problems is what we do best. One of our recently completed living rooms had both in spades. Like many of our fabulous clients, we had worked with this family on a few other projects in their home. With the basement, kitchen and hearth room complete, they were ready to have us tackle their living room. Living rooms are important, because they set the tone for your entire house. It sounds intimidating, right? Which is ironic, because at their best, living rooms should be comfortable and inviting, not closed off or too formal. The original design posed a few challenges. Although the space was large, the room was light on furniture and not utilizing the space to its best advantage. With a large armoire opposite the fireplace and a formal furniture arrangement, the room felt small and awkward. We knew providing a new layout would breathe new life into the space. In addition to a little rearranging, there were a few other challenges we knew we needed to tackle. Resolve the awkward floor plan. Freshen up the tired looking fireplace. Lighten and brighten the space. Soften the back wall to draw the eye to the back of the room. Highlight the floor to ceiling windows. Create a design that complemented the rest of the house’s new finishes, while still maintaining a unique look. As part of our design process, we develop a number of creative solutions to each of the challenges we face. We bounce them off our team before choosing the ones that best meets our client’s specific goals. In instances where our clients don’t have goals outlined, we work with them to learn what they are trying to achieve with the space and how they intend to use it on a daily basis. We then develop a design plan solving each. Our first order of business was to create a new layout that maximized the seating capacity in the room and opened up the floor plan and space. We did this by moving the sofa off to the far wall opposite the fireplace. This helped to balance the weight of the room visually. The fireplace anchored one wall, while a rich, velvety sofa in a deep green did the same on the other. We wanted to keep the remainder of the seating and finishes light and bright, so we picked a rich looking floral for the two chairs backing the window wall and a velvet bench with a little shimmer to slide towards the fireplace. 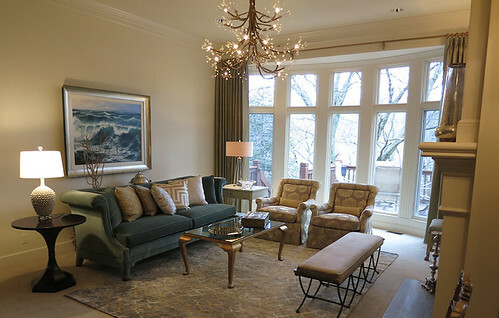 A light green silk was then selected for the ornate chairs flanking the fireplace, while the glass cocktail table was chosen to add subtle glamour to the room. 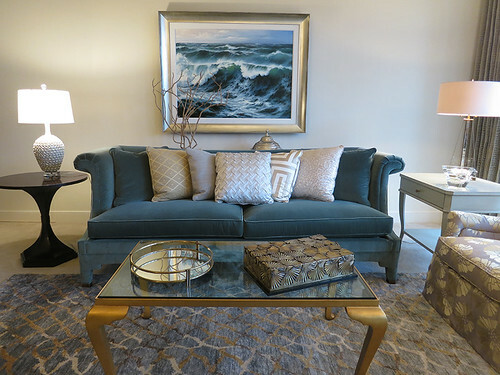 To complement the rest of the house, we selected a color palette for the living room with a variety of rich and soft greens, a pale yellow and a variety of neutrals. These tones played off the shades of blue and green found in the kitchen and hearth rooms, but were different enough to create a unique look for this room. We freshened up the fireplace with a gorgeous grey marble tile. An accent band of gold beaded tile framed the outer edge. It took the fireplace from old and tired to elegant and sophisticated. To brighten the space, we brought in a number of light fixtures. We wanted each one to provide glitz, but also appear light visually. 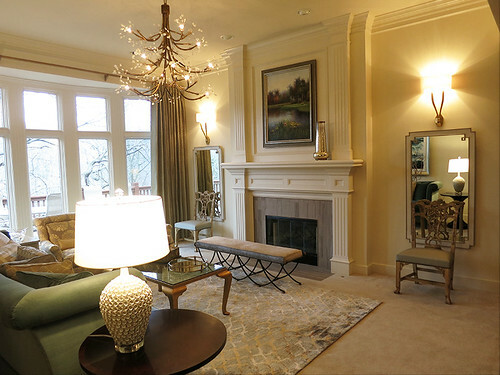 Two commanding and sleek gold sconces were selected to flank the fireplace, while two unique lamps were chosen for each side table. The walls on either side of the fireplace were dressed up with large decorative mirrors. These helped to reflect light around the room. A large chandelier that screams glam was the icing on the cake. We decided on floor to ceiling drapes to highlight and soften the back wall. The windows were left largely uncovered to keep the views of the forest unobstructed. To add a little interest to the room, we chose a light green fabric for the drapes that had a small print and light texture. Curtains with a larger print would have competed with the picture windows and view. One design challenge was addressing the empty walls. On the back wall of the room, we hung a beautiful, oversized, custom oil painting in a deep wide frame to ground the sofa and large wall. The end result was more than we could have hoped for. The client was absolutely thrilled and so were we! This living room is the perfect balance of comfort, glamour and sophistication.